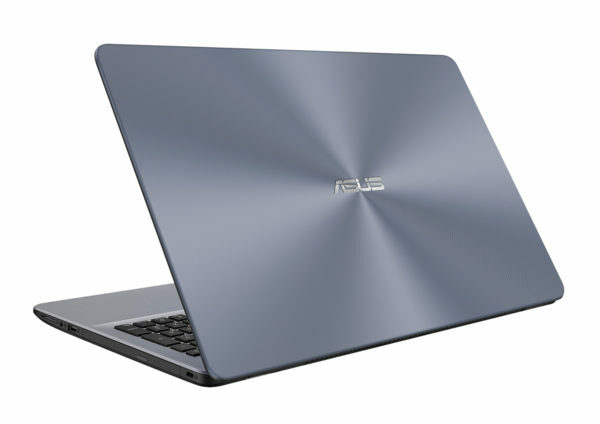 The Asus VivoBook R542BP-GQ076T is a new 15-inch laptop computer designed for office / multimedia use. It benefits from a hybrid storage solution combining a dedicated SSD and a large capacity hard disk, a good amount of RAM (8 GB), a latest generation Dual Core A9 APU and a graphics card. dedicated entry-level. Also plan on a complete connectivity and on relatively compact measurements in an elegant gray hull, for a price displayed at less than 600 euros . 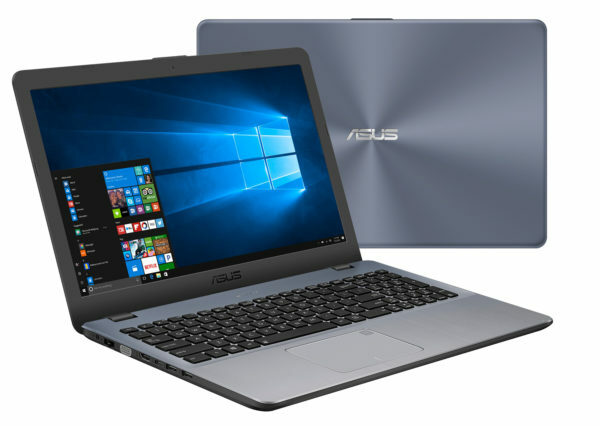 Neat and sober, the Asus VivoBook R542BP-GQ076T’s shell sports a silver-gray color affixed to the lid and the turn of the keyboard. A concentric effect on the back and brushed inside decorate its design, as well as the contrast with the black screen, keyboard and base. In addition, the assembly is satisfactory even if the shell is made entirely of plastic. The keyboard is not backlit. Storage is the spearhead in this configuration thanks to a hybrid solution that puts the emphasis on responsiveness without sacrificing space. In principle, the 128 GB of the SSD will contain the operating system and some of the applications while the 1000 GB hard drive takes care of the storage of your toy library, thus ensuring effective overall performance, ignition phases / shutdown and fast data copies. Second strong point here, the RAM of 8 GB will follow the momentum of fluidity imposed by the SSD with a direct response in multitasking, even if you tend to collect the tabs on the browser. These two reactivity parameters are all the more valuable as they support an APU with limited resources. Indeed, the Dual Core A9-9420 delivers sufficient performance to run all the common tasks (surfing the Internet, office tool, video playback) but in a fairly basic context. The presence of a dedicated graphics card AMD Radeon R5 M420 is worth highlighting even if its usefulness for the game remains debatable. With it, casual players will be content with old and undemanding opuses in the native definition of the slab, provided to lower the graphics settings. Regarding the connection, the finding is satisfactory. We find in particular an SD card reader and two video outputs (HDMI and VGA) to connect the PC to an external screen. Three USB ports are also on the menu including two USB 3.0 and a USB Type-C latest generation, valuable for years to come. Note that the data transfer is provided by the Wifi modules b / g / n and Bluetooth 4.0 of older generation as well as Gigabit Ethernet. Finally, the screen is a bit disappointing compared to the price. The definition is standard (1366 x 768 pixels) and the support of a TN panel provides narrow viewing angles and a medium colorimetry. Good point however, the slab is treated anti-reflective to limit the inconvenience related to exposure to high brightness.